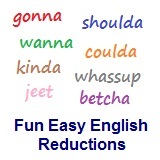 ﻿ Fun Easy English - new-american-english-reductions-reduced-words-topic-word-to-have-to-hafta. In this lesson you will learn the American English reduction hafta. I hafta work overtime tonight. I have to work overtime tonight. Do you hafta be so crazy all the time? What do you hafta do today? Why do you hafta go there? You hafta pay for your food. They hafta travel to Buffalo, New York today. Note: Hafta can be used with singular or plural pronouns like I, you, we, and they. Hafta cannot be used with the singular pronouns he and she. Hafta can be used for interrogative (question) sentences. This American English reduction is used often in everyday conversation. Reductions, such as hafta are not real words in English.